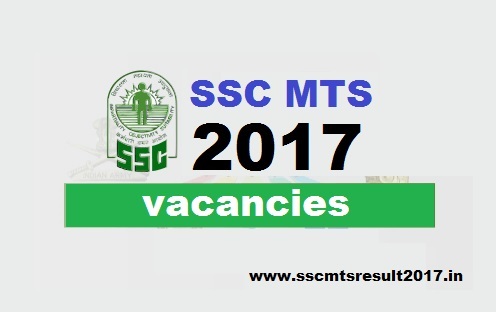 SSC MTS Recruitment 2017 Vacancy details: Staff Selection Commission (SSC) is officially announced 8300 total vacancies for MTS Non Technical Posts. You can find details of vacancies listed in each region. Northern Region is having highest vacancies of 3186 posts with Delhi (2864), Rajasthan (298) and Uttarakhand (24). You can find full list below. Candidates with 10th and 12th pass are eligible to apply for SSC MTS 2017. Exams dates for SSC MTS exam 2017 is fixed and conducted on 3 days. Candidates with age group from 18 to 25 years are eligible to write the exam. Let's check out more details about SSC MTS 2017 Vacancies, qualification, Pay scale, Application fees and selection process below. Let's have a close look at the vacancies available in each regions for 2017 SSC MTS exam below. Candidates with 10th and 12th pass are eligible to apply for SSC MTS 2017 - Staff Selection Commission Multi Tasking Staff Non Technical exam. You can easily crack SSC MTS exam 2017 as the selection procedure is not too tough. You can also read some best SSC MTS books here. Stay tuned for more updates on SSC MTS exam 2017.